Do you know why ‘Hatoda Baraat’ is taken out in Allahabad ahead of Holi every year? 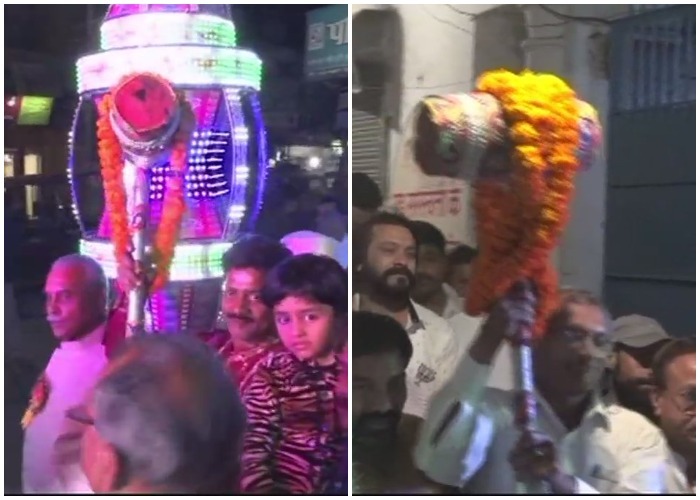 There's a hidden message behind the celebration of Hatoda Baraat (Hammer Procession) every year. Image Source : ANI Do you know why ‘Hatoda Baraat’ is taken out in Allahabad ahead of Holi every year? The festival of colours Holi is just a day away now. The excitement and hues in the air is evident. The festival is celebrated in India by all the people of all ages. In fact, many parts of Europe and North America have also started celebrating Holi, to mark the onset of spring. But before the main festival of Holi, many bizarre rituals are observed inIndia. There is Laddu Mar Holi, Lath Mar Holi which are specific to North India. In some parts, Holi is played using flowers and ashes in place of colours. But there is one bizarre ritual that seemed interesting to us. There’s this Hatoda Baraat, which is a procession taken out every year ahead of Holi. This procession takes place in Sangam city in Allahabad. The hammer procession is taken out every year before Holi. It is a satirical humour where the hammer represents a traditional Indian groom. This year, the Hatoda Baraat was taken out on Wednesday in Allahabad. In this procession, the hammer is decorated like a groom with red turban and flowers. The VIPs of the city join the procession as Baraatis. People dance on Dhol on the street, a common sight which you get to see in a traditional Indian wedding. It is believed that Hatoda Baraat marks the beginning of Holi festivities in Sangam. This tradition has been celebrated in the city for a long while. A Puja is performed before the Baraat to guard the hammer groom from the evil eye. Last year, the Baraat started with the 21 gun salute where each shells were made up of confetti packed into a cracker. Elephants and horses also take part in the procession. Streets are decorated in bright colours. The glitz and glamour of Hatoda Baraat is similar to what we get to see in any other Indian wedding. But apart from the fun, there’s a deep message associated with it. Hatoda Baraat is taken out to celebrated the victory of good over evil. Last year, Hatoda was wedded to Mehengai (inflation). This is done so that hammer can axe inflation and end it for good. Mudgar Baraat is also celebrated followed by Murda Baraat after Holika Dahan.